So I replaced the axles and lost a little bit of fluid. I've done some research on how to fill and drain the fluid. This will be my first time changing manual trans fluid. Seems the consensus is to use the GM fluid. So I fill it from the fill plug. And once it's full, it'll start dripping from the fill hole? Also, is there any specific Allen key you guys use that clear the frame? Is it necessary to have the front and rear of the car level? I cut a cheap key so that it would clear. Worked great. You want the car as level as possible. Personally recc leaning the car as safely and as far as you can toward the drivers side to drain it. Your gonna need a t45/t50 I believe for the drain, I had to custom make a stubby one to clear the frame. When you fill it will have to be level front to rear and side to side. Fill until it is level with the plug. Personally I fill until it starts to drip back out and wait till it stops. An allen head socket on a long extension is all you need to clear the frame. At least the fill plug that is. Cant remember how the drain is. The drain sits about 1.5 inches from the subframe. There's no room for a normal allen key, let alone a socket head. I bought a socket with the torx bit in it, pressed out the bit, Ground down the end and bought a long reach 6pt 8 mm wrench. idk if all cobalts are like this but both my ls and ss have a torx drain plug and a allen fill plug. Stupid gm. Interesting. I went and bought the GM GL-4 fluid this morning. @15 bucks a quart I said, yup! Sadly I won't have time today, but tomorrow and Saturday I will. But it's gonna be raining. Sunday looks to be too cold, but we'll see. Is it a torx? I thought it was just a straight allen. I actually buggered my fill plug (i know, lucky) and replaced it with another drain plug due to a glitch in the parts pricing (the mag drain plug was much cheaper than the plain fill plug). I just cut off a bit from a cheap L-shaped allen key, broke it loose, then finished by hand. I was thinking today that you could do like you did, maybe even use a ratcheting closed wrench to get some more torque on it. Drained the old fluid out. I used a 1/4 ratchet for the drain plug, along with a stubby 8mm hex and it worked perfect. It fit perfectly between the frame and drain bolt. Also used a breaker bar to give me some muscle on the 1/4 ratchet. On the fill plug, a 3/8 ratchet with a 12inch extension, also 8mm hex. Then I started looking how to lift the rear. Is there no way I can lift both rear wheels at the same time? I found this pic for the jacking location. But just wondering if I can lift both sides at once. 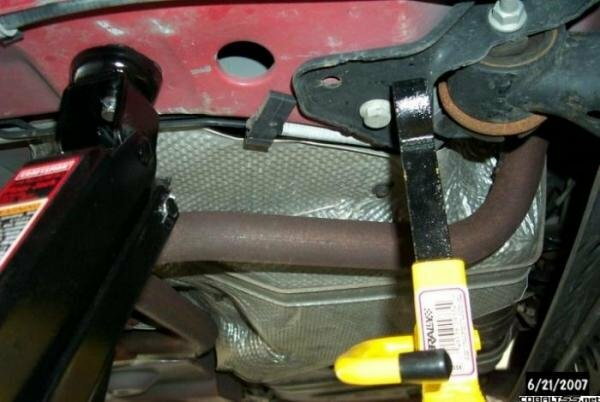 That is not the jacking location for the rear, your supposed to use the pinch rails. That area doesn't bear the weight for the rear suspension. And to answer your question not really. you have to use a jack stand on each side pinch rail. Don't lift from the center of the axle, its not made to support the vehicle weight. Both of mine where only on the bottom plug, I found my bit I use and its a t47. Who knows what gm was doing while freaking out about going bankrupt, probably can find cars like mine with one torx and one hex, or two torx, or even two hex like yours. Awesome, thanks and I figured. If you jack on the pinch weld itself, you're going to crush the pinch weld. I looked at the scissor jack end, and the end of it engages on the surface just behind the weld. That's where I jack the car (pushing the ABS sensor wire away). There's a frame rail there, so I make sure to get that reinforced location. No issues yet. That jack does appear to be "inboard" of the location I use. I have also used that spot for jack stands without issue. Get a rubber puck with a slot cut in it. Use that on your jack. Profit. Ive always used the rails and never folded one in. Usually it gets folded in bc people use too skinny of a pad to push on the weld. (less than 2in) Its supposed to have a flat contact on about 4-6 on the rear rail. I cant recc using that area shown personally bc I have seen that area crushed in on cars from quick lubes jacking the car there to rotate tires. Slowbalts way is definitely the best route to spread the contact area. Got the car level, got the fluid in. Thanks guys. Changing Transmission fluid on the F35, what fluid to use? Zzp stage 1 axles, normal?